Strawberry Parfait is a delicious and quick no bake layer dessert that’s perfect for summer! We are talking layers of whipped cream, fresh strawberries & mango and lady fingers…it’s not too late to indulge in this delicious dessert. This Strawberry Parfait has summer deliciousness written all over it. What can be better than a delicious cool parfait with layers of decadent whipped cream, lady fingers, strawberries and mango? And the best part? This Strawberry Parfait is a no bake dessert! I absolutely love no bake desserts, because really, who wants to turn on the oven on these hot summer days? So what exactly is a Parfait? A parfait is an American dessert that is a layered dessert which usually involves whipped cream or yogurt and fruits. There are so many variants of parfait, which means lots of deliciousness. For this strawberry parfait, I kept it simple but decided to add a twist to the dessert by using lady fingers. Lady fingers are an Italian biscuit (savoiardi in Italian) that are usually used in layering English trifle. In British English they are known as sponge fingers. Lady fingers are perfect for layered desserts because they absorb liquid really well, which makes their texture cake like. And we all know everything cake like is delicious. What’s the difference between an American and French Parfait dessert? Did you know that there’s also a French dessert called Parfait? I didn’t! I found out while I was researching about parfait. French-style parfait is a frozen dessert made from a base of eggs, sugar syrup and cream. So while it sounds quite delicious, it’s completely different from American parfait which is a layered no bake dessert. Why do they call it a Parfait? I loved making this Strawberry Parfait for its simplicity, and fresh fruit always goes so well with whipped cream. The recipe below is a rough estimate as I served it in four short glasses, but that’s the beauty of this recipe, you can make it as you like. Strawberry Parfait is a delicious and quick no bake dessert that’s perfect for summer! Dip each lady finger into milk for a few seconds, and then layer the bottom of your serving dish. Then add a layer of whipped cream, followed by a layer of strawberries. Add an additional layer of lady fingers dipped into milk. 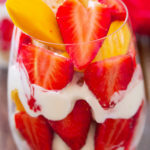 Continue layering until you reach the top of the serving dish, and then garnish with sliced strawberries and mango. Note: I used 4 individual serving glasses as scene in the picture, but you may use one single serving dish and just layer as desired.